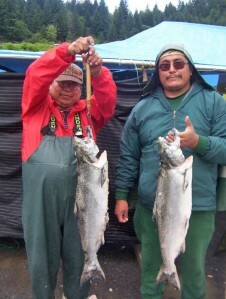 The Columbia River is known for its distinctly flavored, rich red chinook salmon, also called king salmon. For thousands of years, the Columbia has been home to coho, sockeye, chum and steelhead salmon as well as chinook. (See Columbia River Salmon Species) And for thousands of years, the Yakama, Warm Springs, Umatilla and Nez Perce Indians have harvested these fish for commercial purposes and for physical and spiritual sustenance. Today, the Columbia River is the only place in the Northwest where you can share in this historical Indian Salmon Harvest. Tribal fishers can be seen fishing from small boats and from scaffolds with long handled dip nets, as their ancestors did centuries ago. During the late spring, summer and fall, the public can purchase premium Columbia River chinook, coho, steelhead, and sockeye directly from Indian fishers. The fish is fresh, reasonably priced, and can be purchased already cleaned from some vendors. Buying Indian-caught salmon directly from the river is a tradition that non-Indians started participating in some 200 years ago, about the time Lewis and Clark passed through the Columbia Basin. Over-the-bank salmon sales help Indian fishers support their families and make it possible for them to continue their traditional livelihood. To find out where the day’s catch is being sold, call the Salmon Marketing program at (888) 289-1855, (503) 238-0667 during normal business hours. Days, times and availability vary. Sales are cash only. Ask for a receipt from your vendor. Check out our Fresh Salmon Buying Tips.